What does LeBron James' backing of Tristan Thompson mean for Kevin Love? 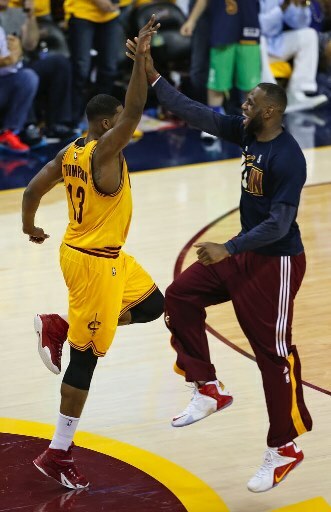 The unquestioned leader of the Cavaliers (and best basketball player on the planet) is LeBron James, but the breakout player for the Cavs in this year’s playoffs might be Tristan Thompson. Thompson, a power forward/center, was relegated to sixth man duty when Cleveland traded for Kevin Love in the offseason. But he has been a revelation in the postseason since Love was injured late in a first-round sweep of the Celtics. In the Cavs’ past seven games — all wins — Thompson is averaging a double-double while logging heavy minutes and contributing key plays late in games. If LeBron wants Thompson, he’ll probably get Thompson … but it’s also hard to believe there is room for all the big men the Cavs have collected. Thompson will get big money. Center Anderson Varejao, also injured this year, is due more than $9 million each of the next two seasons. The Cavs also have a team option on Timofey Mozgov, for whom they traded Denver two future first round picks (one from OKC and one from Memphis, so the picks could be decent at some point). So where does that leave Love? Well, he can opt out of his contract and become a free agent or he can stay with the Cavs and be paid for one more season at more than $16 million for the year. He has said he doesn’t intend to opt out, but his less-than-perfect relationship with LeBron combined with his injury and Thompson’s emergence could cause him to rethink that position. If Love opts out, it’s hard to imagine the Cavaliers just letting him walk after giving away Andrew Wiggins in a trade for him, but if they win a title without him … well, it gets easier to imagine life without him — particularly if life with Thompson makes more sense and is coveted by LeBron.